It has almost been a year since I fought and won my battle with Cancer. Over this past year I have grown leaps and bounds and really given a lot of thought to my life and what my purpose is. I have decided it is to help others as much as possible with their fight with cancer, health, and nutrition. My career will always be writing and cooking, but I also want to donate 40 hours of my time each month to helping those with cancer, or recovering from cancer. The problem is, I need your help! Hi! My name is Christi and I am a cancer survivor. I have been cancer free since August 6th of 2013. Having a softball sized malignant tumor removed from my uterus, and living with that tumor for so long, caused me to lose my muscle mass, my drive, my passion. But I am a fighter! I told my doctor I wanted my life back and he recommended yoga. I remember the day I walked a half a mile to a little studio I had heard positive things about. I was so nervous. I had never done an official yoga pose in my life. I was self proclaimed: "NOT FLEXIBLE" I went anyway. I wanted my life back. That first class was not an "aha" moment. Turns out I accidentally went to an advanced class. I barely made it out alive. I thought: "What am I thinking? I am not strong enough". I went back anyway. It took 2 weeks for me to fall in love with yoga. It changed every aspect of my life. I grew in my relationship with my savior, and I learned so much about myself. Yoga is now a permanent part of me. I can fast forward to now, where my cancer weight is gone, I am healthy, cancer free, and much more flexible than I ever thought. But what I really want to do, is get down to why I want to now teach. Actually, I do not want to just go to a traditional studio and teach. I want to offer my services to cancer patients, and cancer survivors for free. I want to donate my time, I just need the certificate to do so. Folks let me tell you a little something about cancer patients. They have no money, no life, and very little hope. I am a fully insured patient. Meaning my husband has great health insurance. However after all was said and done, my 90% coverage still left me with a $32,000 bill to pay. I am still paying. The cost of living is very high once you have the cancer mark on you. It leaves very little for a survivor to do. All your money is gone and you are left wanting to live, but not knowing how to get back to life. Once your pathology is clear, the doctors say: "see you for your next test in 3 months! ", you will have to pay for that test too. Yes, every 3 months for the rest of your life, you will have the test, and hope that everything comes back ok. 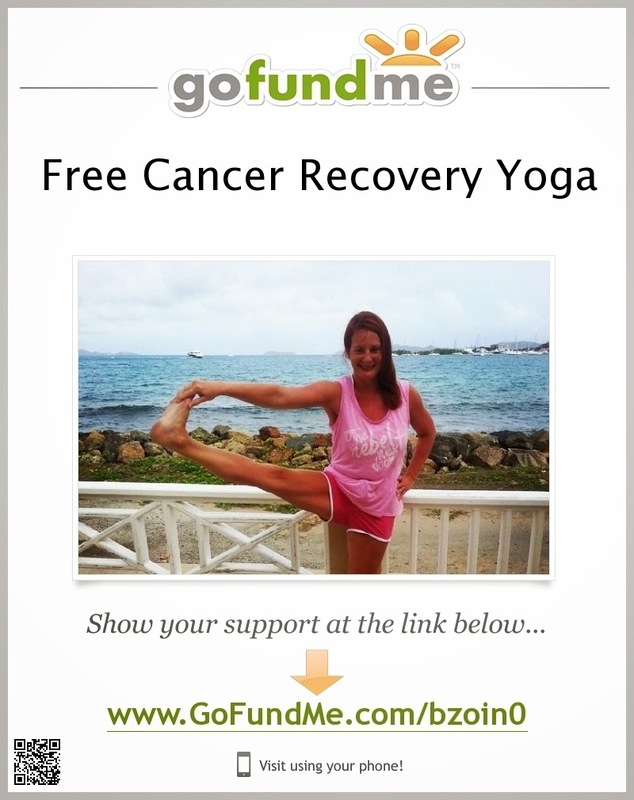 I want to start recovery yoga that is free to any cancer patient, or cancer survivor. The trouble is, I need to get fully certified. I am still paying my $32,000 bill to the hospital in payments, and yoga training is expensive. Most range from $2,500 to $3,500. The program I am looking at is an excelerated teaching plan, and this will just cover tuition. So what I am asking for are people who want to pay it forward. Do you know that by the year 2050 they estimate one in four people will have cancer? I want to be there for those people FOR FREE! I don't want a money making teaching career. I want to donate my time to help others that are lost from their cancer battle like I was. I can't offer you reward levels or great prizes for donating. I am simply asking for your help to get trained so I can help others. I believe this is my calling. So I am leaving it up to God. They say you never know if you don't ask, and asking is way way way out of my comfort zone. If this is meant to be, it will happen. Thank you in advance for even reading this. If you can share it maybe with others that have the same vision I do, that would be tremendous. I have a book called "NOURISH - The beginners guide to eating healthy and staying fit" coming out next April. I would like to be certified by then so that I can travel and give free workshops to those who struggle with cancer. I want to teach both the nutritional and physical aspect of staying healthy. It begins with what you eat and movement of the body. Thank you for any help. Even $1 helps!